As you may be aware many industries are regulated, so when it comes to training for a specific role, there are training courses which have a defined curriculum and the trainee must attain a certain level in order to pass the course. However, In-service Inspection and Testing of Electrical Equipment – otherwise known as Portable Appliance Testing or PAT Testing, is only covered by a set of guidelines, the IET Code of Practice (4th Edition). Therefore any associated training courses can be very comprehensive and professional, or they could be a waste of time. To ensure you know everything you need to know, we cover all of the following points on our PAT Testing Training Courses. Which tests should not be carried out? PAT Testing is an important part of running a safe organisation, but with budgets being squeezed all of the time, it is important that savings are made wherever possible. This is where we can help. 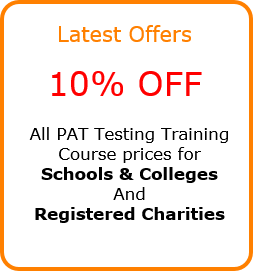 In an effort to give something back to the community, we have decided to offer a 10% discount on all of our PAT Testing Courses for schools and charities. You will get the same quality PAT Testing Course, delivered by a qualified and experienced PAT Testing instructor, who will be able to deal with any queries you have relating to your organisation. Embarking on a new project can be a little daunting – especially when it involves technical aspects which you haven’t been involved in before. When the boss says “you are going on a PAT Testing Course”, some people are understandably filled with dread. However, we have developed a course with this in mind. To ensure you know everything you need to know, we cover all aspects of PAT Testing on our PAT Testing Training Courses. offices where we can train you in our training suite. We run monthly open courses for up to 8 delegates. We have a good selection of appliances and test equipment to help build your knowledge of appliances and how to ensure they are safe. The courses are informative without being boring – whilst we could entertain you with endless Powerpoint presentations, we choose not to and would rather involve you with plenty of hands-on examples. This is a generic PAT Testing Course designed for all levels of ability, covering typical electrical equipment likely to be found in any office, kitchen, workshop, school, shop or laboratory environment. Whilst it’s not a legal requirement to ‘PAT Test’, ensuring electrical equipment in your workplace is safe to use certainly is. In-service Inspection and Testing of Electrical Equipment – aka PAT Testing, is the recognised method of ensuring electrical equipment is safe, but is often carried out incorrectly or ineffectively, leading to extra costs and safety issues. By learning what is required and how to implement it, you can control the process of in-house PAT Testing or effectively manage a visiting PAT Testing contractor. Whereas you are concerned with the safety of your premises, a contractor is typically driven by other factors – money and speed. Whilst an electrical background certainly isn’t necessary, an understanding of basic electrical principals will help the trainee, although these can be incorporated into the course as required. To be a successful PAT Tester you need technical ability; common sense; a good eye for detail; and a good attitude. Some of these we can teach, but some are linked to your personality. 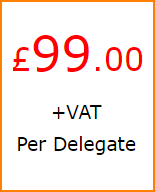 All we ask is for the delegates to take part in the training and give us 100%. We would suggest that all delegates attempt our PAT Testing Quiz to help them prepare. Doing this bit of ‘homework’ significantly improves your chances of passing the course.